This is Dredd Alert: a potentially ill-advised attempt to write about the adventures of Judge Dredd, Mega-City One and his universe. I'll be working my way through the Judge Dredd and Dredd-verse comic strips in 2000 AD and its sister publications at the rate of one-per-day. So where to start? 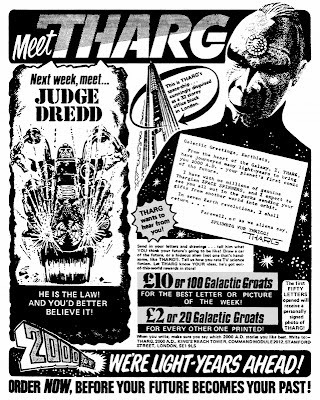 Well, surely it makes sense to start at the beginning, the very first Prog of 2000 AD, but it's a well known fact that Judge Dredd isn't in the very first Prog of 2000 AD, and as with a great many well known facts it's not true. I know it's only a preview, but as introductions go it's an interesting one. The phrase "He is the law!" is incredibly cool, but following it with "And you'd better believe it!" implies the strip is somehow a spiritual meditation on belief, faith or doubt. The choice of image is also interesting. Not Dredd with his gun out. Or even so you can see really his face. Upon seeing that image in a comic boasting the first part of Harlem Heroes, you could be forgiven for thinking that Judge Dredd would be about racing bikes. This piece also introduces the editor of 2000 AD: Tharg. It's a brilliant conceit if untrue, but the existence of Tharg has never been proven one way or the other. On the one hand there are his appearances in nearly two thousand progs, on the other hand I think his salary went to Pat Mills. The exchange rate was £1 to 10 Galactic Groats, so you could buy the first Prog for a single Galactic Groat and still get change for a couple of penny sweets. Sadly those days are gone. The length of the strips varies quite a lot and so this keeps track of how long each strip is. Where the strip has been made available after its first appearance. A one-line description of the strip's story content. Pointing out the first and last time that something important happens. I'd imagine there will be a lot of firsts at the beginning and a lot of lasts later on. I try to glean as much info as possible from the comic strip. Possibly too much. Biographical information revealed in the strip about Dredd. Biographical information revealed in the strip about other characters. The number of arrests made and for what. People die. Here's how and how many. My favourite line of dialogue in the strip. My least favourite line of dialogue in the strip. Those repeated lines of dialogue and slang. References to earlier comic strips and appearances of characters from other comic strips. What may have have inspired the story of this strip. It may not, I'm largely guessing. Also other pieces of pop-culture referred to within the strip. Mistakes are made. Details of when a strip contradicts itself or its predecessors are here. 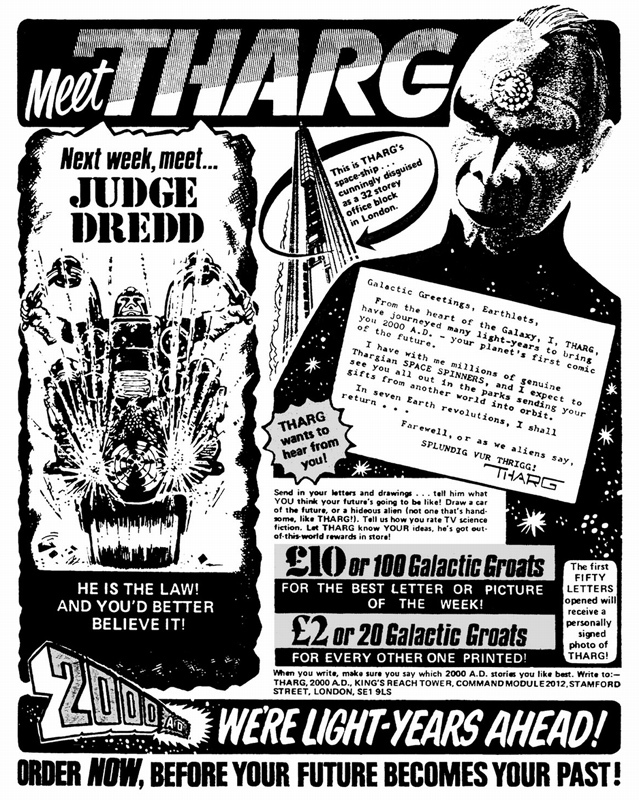 Dredd and 2000 AD have a long history and so it's difficult not to read the strips without knowing what would come later, both in Dredd's future and indeed in the real world after publication. Anything else not sufficiently covered by the other headings. Details of who wrote the script, who drew the artwork and who lettered the letters. I finally step off the fence and tell you what I actually think of the strip.